When politicians make decisions you do not agree with, or if the dominant discourse in society neglects issues you stand for, protesting is a way to show your concerns. Often, a protest contains the occupation of a public space, while shouting or chanting phrases on the matter you want to raise awareness for, with a group of people. By attracting attention in public space, people in the city are confronted with the group of protesting people. However, this way of protesting is outdated and can even be counterproductive by creating a feeling of aversion towards the people protesting. We need new forms of protest, new forms that are more inclusive and affective. What if passers-by can be included in the protest instead of irritated, or even intimidated, by the uniform mass of people occupying space? Since the idea of protesting on the street is to get attention on a specific matter by others, either passers-by or the media, spectators have always been part of the protest. However, in a binary way: either you are part of the protesting group from the beginning or you are not. For spectators to get involved in the protest too, the standard way of protesting as described above should be changed. To do so, protest organisers can learn from street performers to loosen up the binary character of conventional protests. Professor in communication and culture Jhessica Reia did research on the affective quality of street performers in Rio de Janeiro (Reia, 2017). The strength of the street performances in Rio de Janeiro lays at their encounter with passers-by. These encounters are not merely one of looking and being looked at, but one of interaction and affect. Besides striving for a public art movement, “[m]ost of the performances by these artists also promote spontaneous encounters and foster the participation of citizens – actively or by eliciting reflection on space, time, and the issues being laid bare – creating memories and sensations that might last longer after the performance has vanished.”, as Reia mentions in her book Performative Citizenship. Although a majority of the street performers do not see themselves as a protest but as a proposal to the city, people who do want to protest can learn from the way street performers occupy public space. Instead of forming a counter-front that is inaccessible for random passers-by because of the mass of chanting people, protesting can become more inclusive. And, as Jhessica Reia argues, the creation of an affective memory in space can linger for long after experiencing the encounter with the street performers (Reia, 2017). Thus, random passers-by can become emotionally invested in the cause you want to raise awareness for, instead of annoyed by the people who are occupying public space while chanting. An example of including people in a protest, is the march against sending Afghani refugees back to their home country. The march, that took place in Utrecht on the sixth of October last year, existed of different elements, each a bit more approachable and inclusive. First, a group of people walked from Dom square through the city centre towards the city council building on Utrecht central station. This way of protest, a walking and chanting group of people who had met on purpose, is conventional and creates a binary between protester and spectator. The onlookers can merely look at the group that walks past them for a short period of time. Then, once the group arrived at Utrecht central station in front of the Utrecht city council, different people, amongst which Afghani’s, the protest organisers and a politician, spoke about the matter and a refugee from Afghanistan sung an Afghani song. At this part of the protest, passers-by had time to listen to arguments and hear stories about the matter from different angles, allowing them to become rationally and emotionally invested. At the end, we let red kites, which is the national symbol for Afghanistan, fly. Besides a fun practice, flying kites together opened up space for interaction between people that joined the protest and included people who were merely passers-by before. This form of meaningful encounter contrasts the otherwise oppositional image of a protest between protesters and onlookers. Instead of forming a group of people by their uniform thoughts, the interactive character and approachability of inviting people to fly kites with Afghani’s and other supporters includes passers-by in the protest, creating space for dialogue and conversation. Reia, Jhessica. “Chapter 7: ‘We Are not a Protest’. Street Performance and/as Public Art in the City of Rio De Janeiro.” Performative Citizenship: Public Art, Urban Design, and Political Participation. Eds. Laura Iannelli and Pierluigi Musarò. Fano: Mimesis International, 2017. 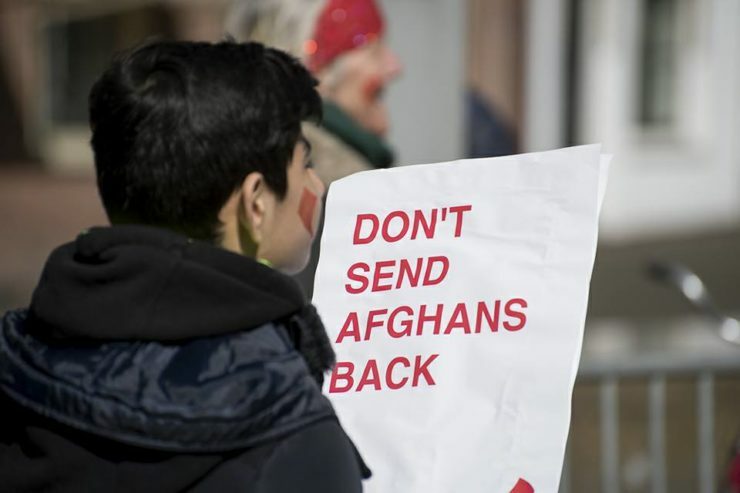 Photos from the Facebook page “Don’t Send Afghans Back – NL”, https://www.facebook.com/dontsendafghansbacknl/.